You are currently browsing the category archive for the ‘The Beach’ category. Well, you had to know this was coming. 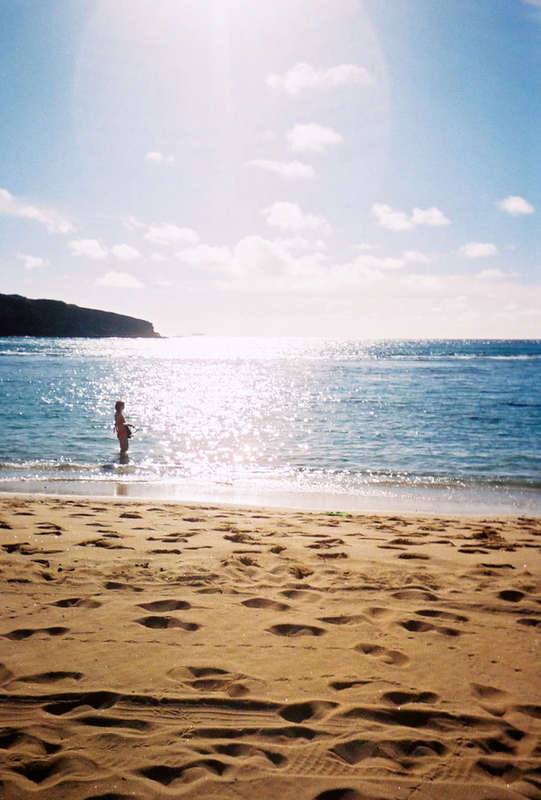 What’s a trip to Hawaii without beaches? Not much, I’m here to tell you. 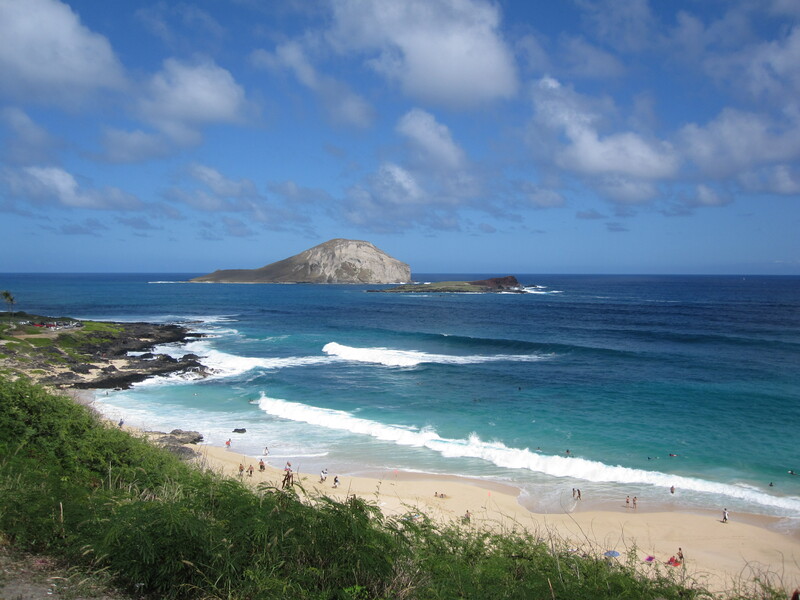 Here are a few of our favorites on the island of Oahu. 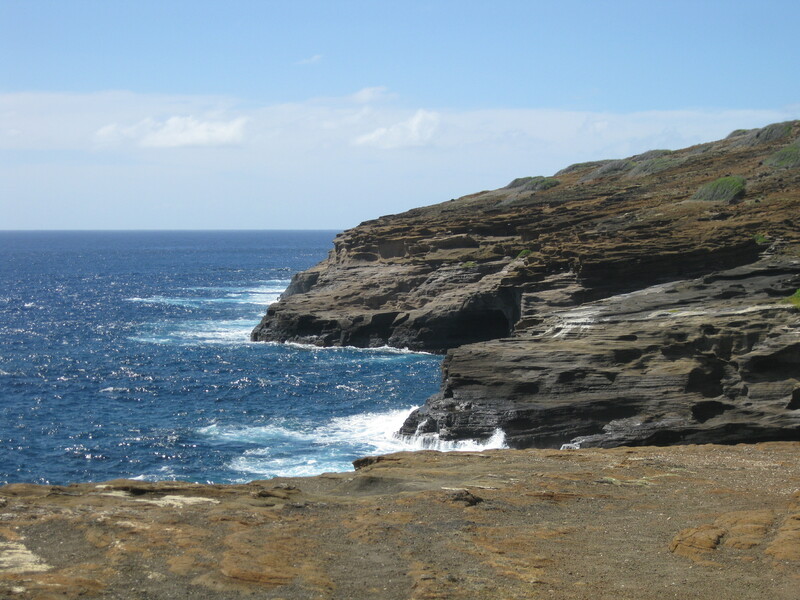 Some of the most gorgeous shorelines you’ll find anywhere are along the southeastern coast of Oahu just passed Hanauma Bay heading northeast. The colors on this part of the island are blinding. 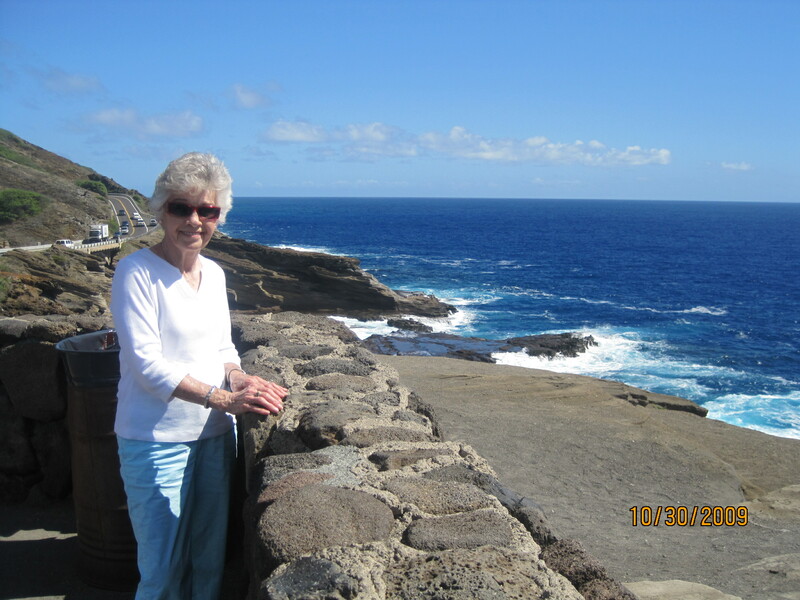 We stopped at several pullouts along Kalanianaole Highway to snap pictures and enjoy the sunshine. 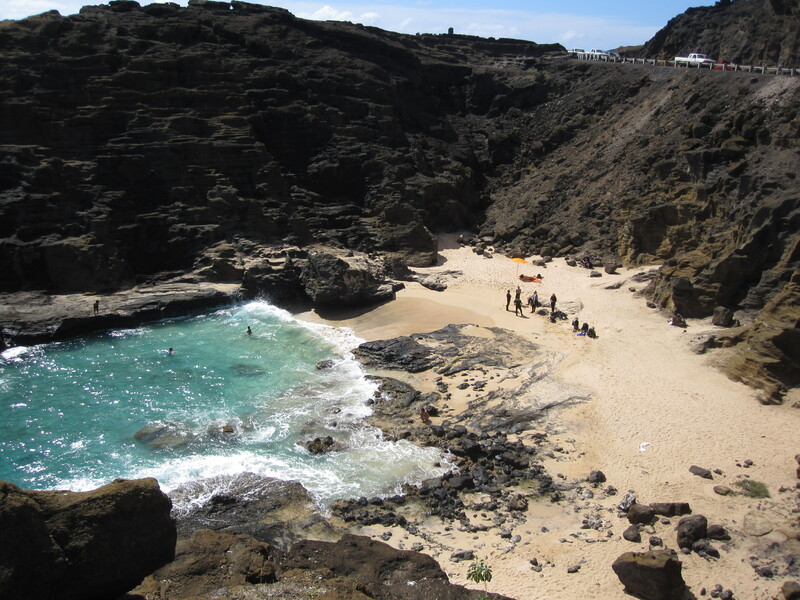 While stopped at this pullout, we got to see the beach where the famous love scene in From Here to Eternity was filmed. 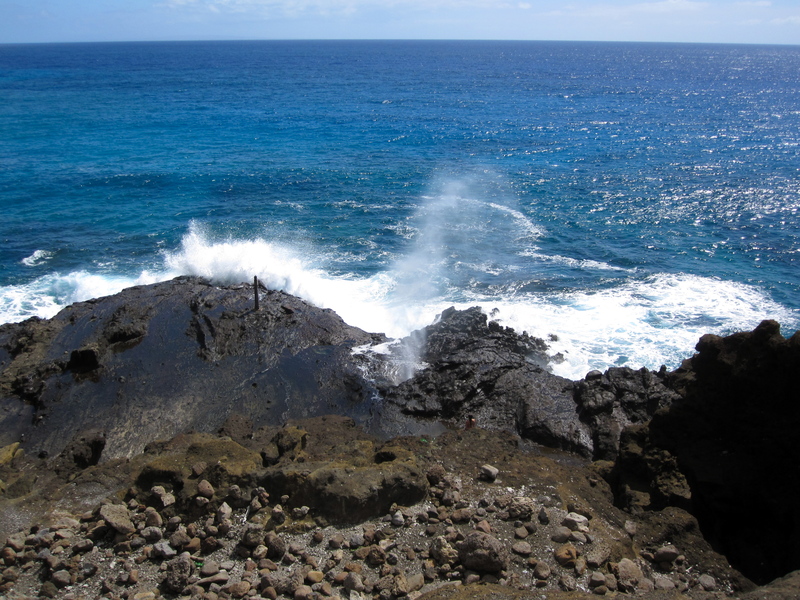 You would really have to want to get to that beach to climb down the lava cliff it takes to get there. But gorgeous. Absolutely gorgeous. 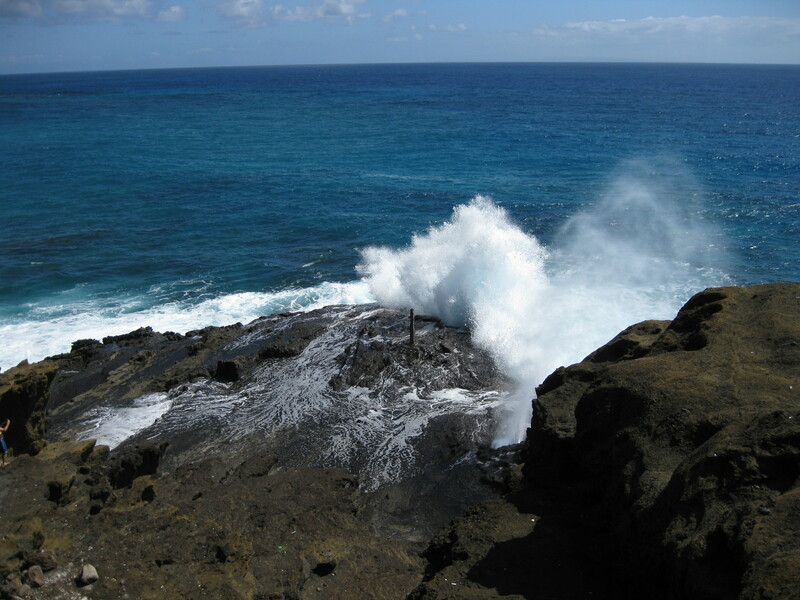 A few miles further on, we stopped to see (and, of course, take pictures of) the Halona Blowhole. No, Ruth. We’re not in Kansas anymore…we’re not in Missouri, either. At the beach in the picture below, signs warn people to stay out of the water unless they are expert swimmers and/or surfers. The waves here looked enormous–at least, they did until we got to the North Shore–even so, I wouldn’t ignore the signs! 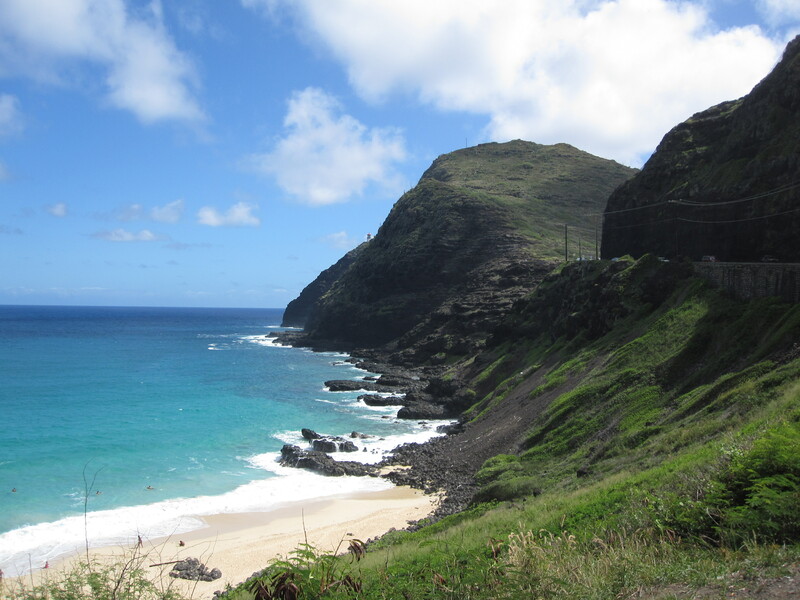 Further up the shoreline, we stopped to take pictures of Kaohikaipu Island (also called Rabbit Island–don’t ask me why–they told us when I was there last winter, but I don’t remember the details) and the Makapuu Point Lighthouse. 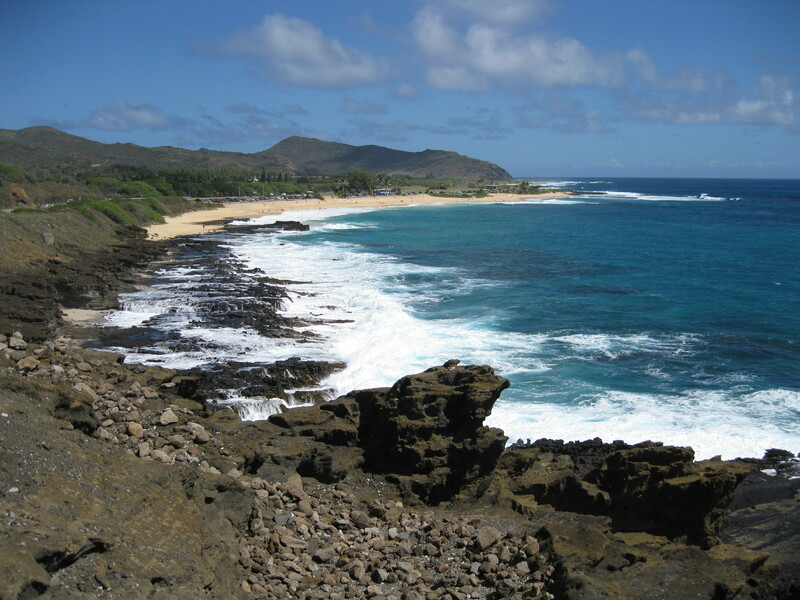 Unfortunately, our stops at all these gorgeous beaches were for photo ops only, no swimming. That changed a few days later when Janie, Carey, and I spent the morning snorkeling and swimming at Hanauma Bay…even though there were jellyfish warnings posted. Danger, Will Robinson! Run away! Run away! Really. 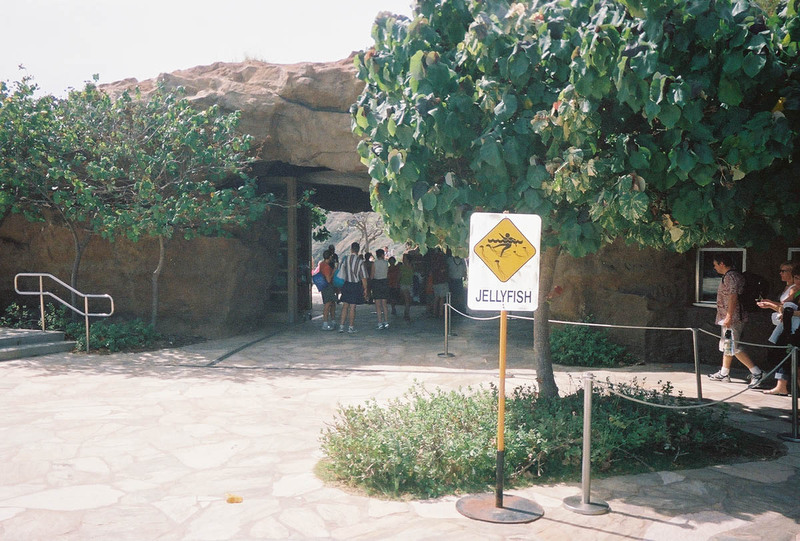 Jellyfish warning signs. Apparently, when park personnel arrived that morning to open the bay to the public, they found close to 200 Portuguese Man o’ War jellyfish washed up onto the beach. Oooooo. Good thing we left Carole in Honolulu. 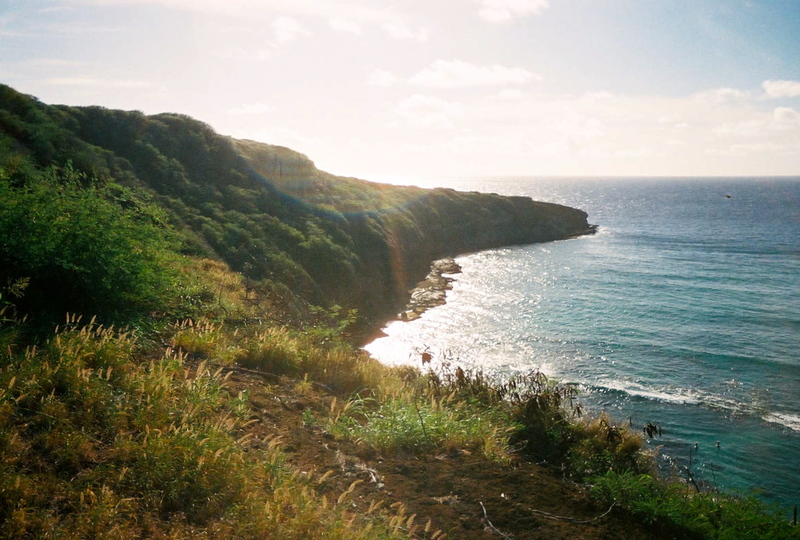 But Hanauma Bay is absolute Paradise. How could we possibly NOT get in? So we did, and we didn’t see a single jellyfish…except on the signs. 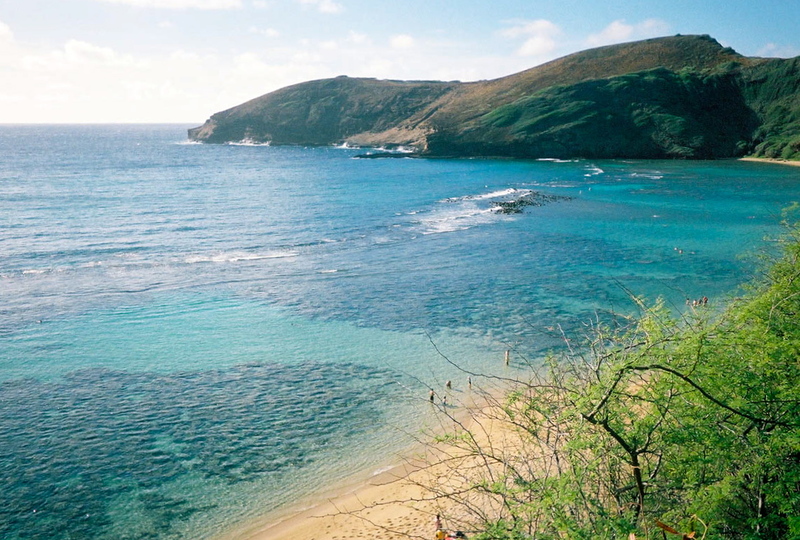 Hanauma Bay is essentially an enormous natural aquarium, a protected ecosystem where sea lions, turtles, and spinner dolphins frolic year round. 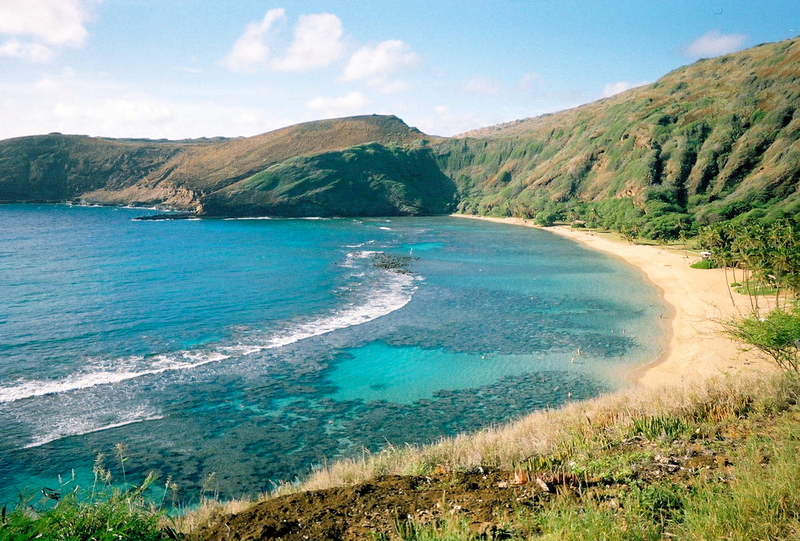 In the winter, particularly in February, Hanauma Bay becomes a prime spot for whale watching. We also enjoyed the sand, the sunshine, a snooze, the sound of the waves, the incredibly blue sky…another snooze. I’m extremely fortunate and grateful to have enjoyed a number of beach vacations in recent years. Beach chairs set up on the warm sand by resort staff, cloudless blue skies, palm trees swaying in the tropical breeze, the soothing sound of the waves lapping the shore, and, on many occasions, cabana boys bringing me flavorful drinks with chunks of fruit hanging from the rim of the glass while I recline under the shade of a thatched umbrella reading a good book. Ahhhhh. Does it get any better? Well…actually, yes. Last week, I had the privilege of going to the beach on South Padre Island with my sister, Amy, my niece, Elisha, and my two great-nephews, Jesse and Cameron, ages eight and three respectively. For an hour and a half prior to our departure, Elisha filled zip-loc bags with food; loaded and iced a cooler big enough to have its own zip code; gathered beach chairs, towels, and umbrellas; filled water jugs; chased two excited little boys into their swim trunks; and schlepped all the aforementioned stuff (excluding the boys) outside to tie down in the bed of her truck, insisting the entire time she didn’t need any help. I was worn out just watching her. After driving just over an hour to get there, Elisha parked along a residential street that ran parallel to the beach. We clamored out, doors open wide as the truck was unloaded into the hot, muggy Texas afternoon sunshine. Squirmy little boys were slathered head-to-toe in sunscreen before chairs, umbrellas, beach bags, and inflatable beach toys were hoiked onto every available shoulder, arm, and hip for the quarter-mile-plus hike down the street, over the sand dunes, and across the beach to a spot which was selected solely for its proximity to the walkway back over the dunes and back to the truck. Hey, you try dragging the monster cooler through the sand! Within minutes, we had umbrella stands screwed into the sand, umbrellas up battling the wind, chairs unfolded and situated–along with the cooler–in the shade of the umbrellas, and towels unfolded and ready for use, all to the tune of, “Can we get in the water now? Can we get in the water now?” My sister can be soooo impatient. I was personally ready for a beach chair, a fruity drink, and a good book, but it was not to be. Jesse and Cameron had other ideas, and none of them had to do with sitting in the shade. Here, it must be said, that I had never been that far south on the Texas coast, and it was much nicer than I had expected. Granted, I wouldn’t want to be in South Padre during Spring Break, but I will certainly look forward to going back with Elisha and her family at other times of the year. The sand was clean and beautiful, the water was clear, warm, and free of seaweed, and the beach was busy, but not crowded. On that particular day, the current had created what Elisha called–for lack of a better term–a wading pool. Between the shore and a sand bar approximately 50 feet out, the water was no deeper than 18 inches. Also, because of the sand bar, and another approximately 50-75 feet beyond the first, the waves were tamer than they would have been otherwise, perfect for cautious eight-year-olds and fearless three-year-olds. 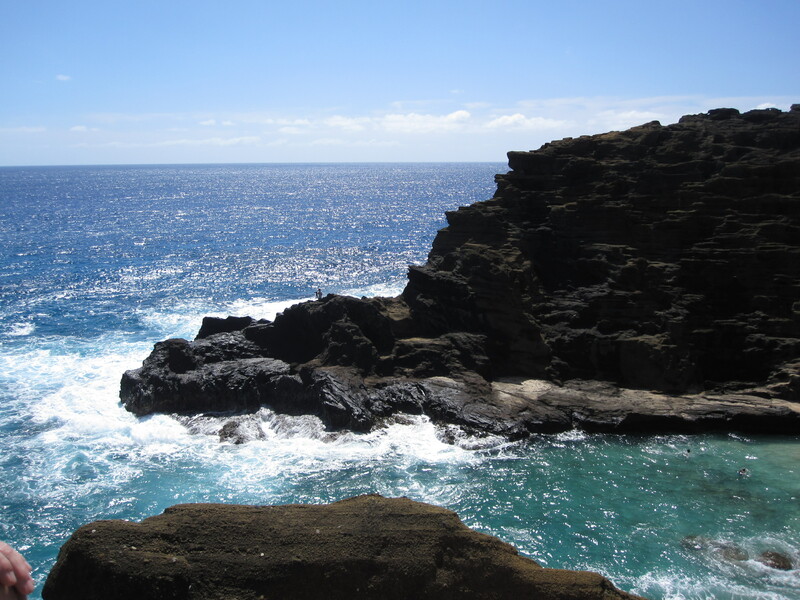 For what seemed like minutes, but turned out to be hours, we bobbed in the waves, tried our luck floating in the inner tubes, watched for the tiny fish we occasionally saw swimming around our feet, tried to hold our breath the longest, practiced backward underwater somersaults, and looked for seashells along the edge of the water. Occasionally, when thirst or hunger could no longer be ignored, we would head to the shade for a bit of rest and to raid the cooler for goodies. During one such raid, Cameron grabbed the bag of trail mix and, with a conspiratorial look in my direction, began plucking the M&Ms from the mix, healthy peanuts and raisins be damned. I smiled and said nothing. The prerogative of a great-aunt, right? When someone finally did think to ask about the time, we were shocked to learn that it was well past 7 p.m. Time to gather up our belongings, drag ourselves and our plunder back to the truck, and get as cleaned up as possible (thanks to the jugs of water that Elisha had thought to bring) before meeting Elisha’s husband, Jesse, at one of the local restaurants for dinner. By the time we collapsed into the chairs at the restaurant, I was exhausted, slightly sun-burned, sticky from the salt water, and had sand hidden where sand should never be hidden. 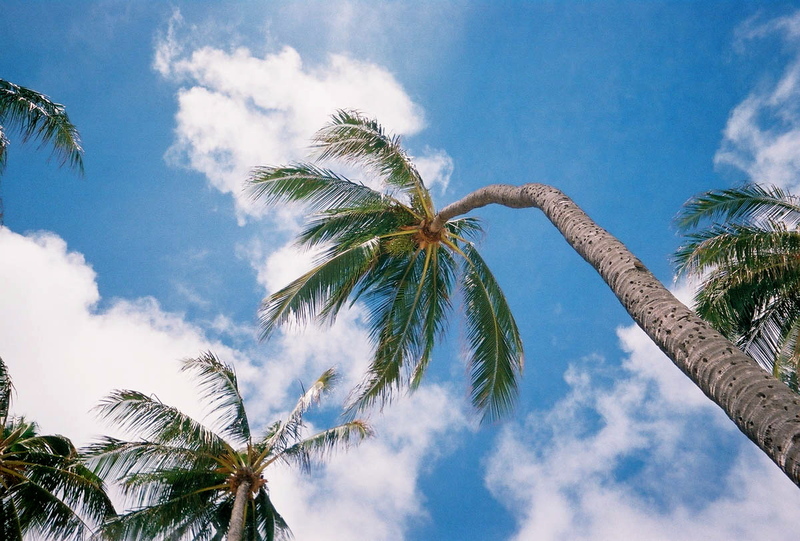 As I sipped iced tea and snuggled a sleeping Cameron on my lap, I marveled that at no time during the entire afternoon had I been near a lounge chair, a book, a fruity drink, or a cabana boy, but I had undoubtedly just experienced one of the best days I’d ever spent at a beach. All because two of the sweetest, most energetic little boys on the planet had reminded me how much fun a beach can really be.